The one-two whammy of a Superbowl in New Orleans right in the middle of the Mardi Gras season spelled dietary disaster for many locals. King cakes, hot wings, the first crawfish boils of the season, locally brewed beer in convenient cans for parade-route consumption, followed by more king cakes: we all need a big ol’ diet detox. Hey, now–I’m not going all Dr. Oz on you. I just need a few fruit and yogurt mornings, followed by fresh juice plus a salad lunches. And a smoothie or two for good measure. To stimulate the healthy eating vibes, I’m focusing on whole grains as of late. Whole wheat belgian waffles, whole wheat + oatmeal cookies, and whole grain pizza crusts proved to be every bit as tasty as their refined flour counterparts. While on my whole grain roll, I stumbled across David Lebovitz’s favorite granola recipe, which is adapted from a Nigella Lawson recipe. The recipe differs from classic granola by substituting unsweetened applesauce for the copious butter/oil used to encourage toasting in traditional recipes. I tweaked his version of her recipe a tiny bit, substituting my favorite seeds, nuts, and sweeteners, plus a dollop of monounsaturated nut oil. With a big batch of this granola on hand, healthy Lenten fruit and yogurt breakfasts won’t seem like a penance after all. (Though a theologian might argue a non penitential penance misses the whole point.) 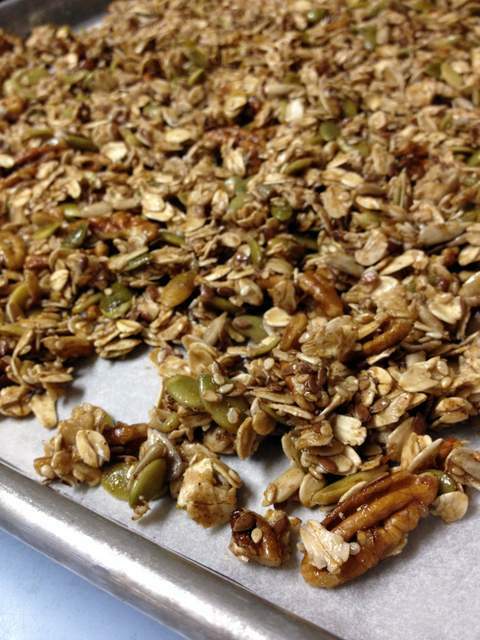 Even those not in need of a whole grain intervention will be pleased with this slightly sweet, very nutty granola (pictured above, prior to baking). Line two large baking sheets with parchment or foil. Heat oven to 325 degrees. In a very large bowl, mix oats, nuts, seeds, brown sugar, cinnamon, ginger, and salt. Set aside. In a small saucepan, heat applesauce, maple syrup, honey, cane syrup, and walnut oil together until butter is melted and honey dissolves. Pour the heated applesauce mixture over the oat mixture; stir until all of the mixture is evenly coated. Spread it onto the lined sheet pans. Bake until deep golden brown, from 35-45 minutes. Remove from oven and cool on sheet pans. Store in an airtight container.